This elegant curved bangle from the twirl collection is made in ethical silver with a glossy pale velvet grey pearl. 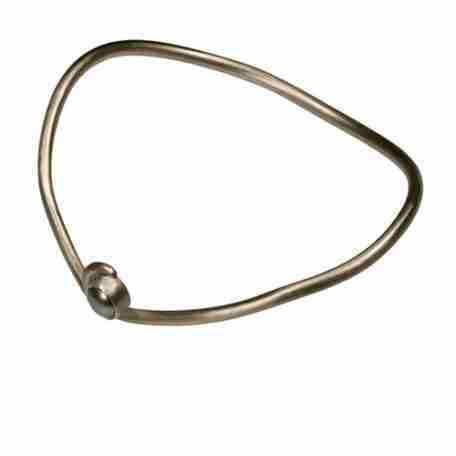 The bangle would make a great everyday piece of jewellery which can be stacked with other bangles for the evening. Would you like to make an inquiry? You can contact farah@farahqureshi.co.uk for further information. Delivery times are between three to four weeks. 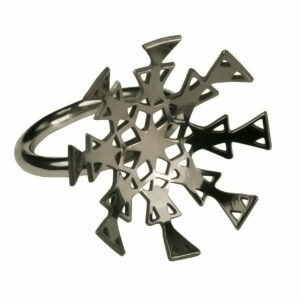 A delightful polished silver ring based around the theme of snowflakes. Inspired by snowflakes under the microscope. The ring is made in sterling ethical silver and the mechanical styled snowflake is either oxidized or plated with a black rhodium plate. The top of the ring measures 3cm x 3cm. The ring is currently made to order in a variety of different sizes, please contact: farah@farahqureshi.co.uk for further information. This bracelet is a great classical piece, which is made in ethical sterling silver and can be worn for everyday wear or can be added to with additional pieces for the evening. Would you like to make and inquiry? You can contact farah@farahqureshi.co.uk for further information. Please note that all the products are made in the U.K and can take up to three weeks to make and deliver. 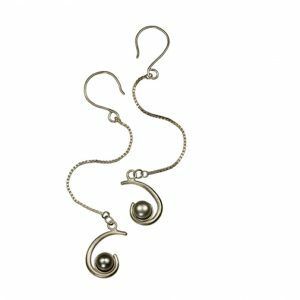 An elegant pair of curvy earrings from the Twirl collection made in ethical sterling silver with glossy velvet grey pearls on dainty fine chain. The earrings would make great everyday pieces which can be dressed up for the evening. Would you like to make an inquiry? You can contact farah@farahqureshi.co.uk for further information. The earrings take between three to four weeks to make and send. This bangle is both contemporary and elegant. 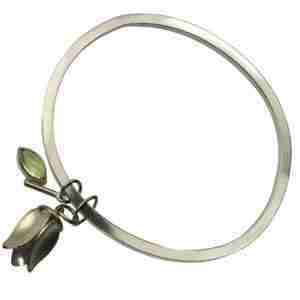 The silver floral bangle is made in ethical sterling silver with a glossy apple green peridot gem. 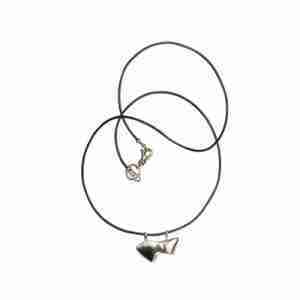 The piece is great for both day and evening wear. Would you like to make an inquiry? You can contact farah@farahqureshi.co.uk for further information. Delivery times are between three to four weeks. 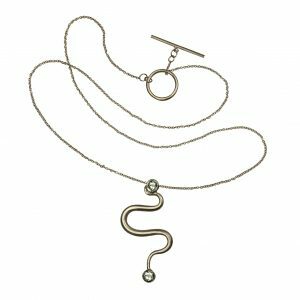 A stunning and stylish necklace made in ethical sterling, polished silver with a textured finish called reticulation. 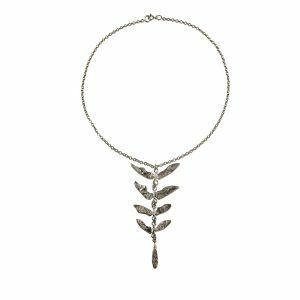 The necklace has been inspired by visits to botanical gardens. This piece is currently made to order and will take approximately three weeks to make and send. Would you like to make an inquiry, please contact farah@farahqureshi.co.uk for further information. 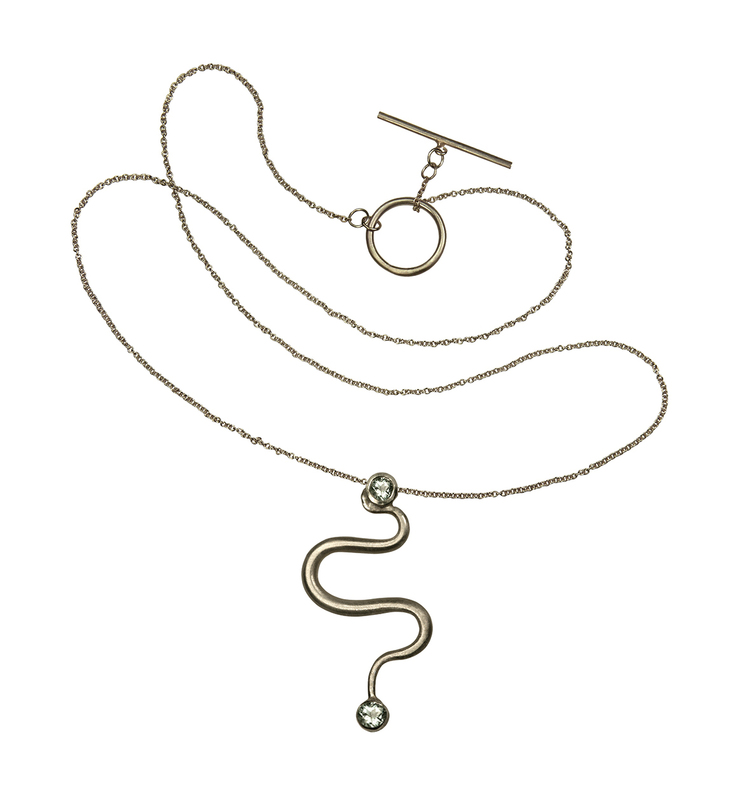 A fun and wearable pendant, inspired by the natural world. 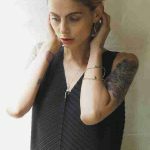 The jewellery is made in ethical polished silver with fine steely grey leather. This is a fabulous piece for the day or evening, great to layer with other pieces for a more stand out look. Would you like to make an inquiry? Please contact farah@farahqureshi.co.uk for further information. Jewellery currently takes approximately three weeks to make in London and send.